Hi everyone. Continuing on with my new found love of stenciling! :) I've used two stencils for today's one-layer card. I know it's actually two layers because I almost always include a card front that's just 3/8" smaller than my card base, but the card front is completely flat with no embellishments - so I consider this one-layer. I have been inspired for a long time by an amazing card artist, and fellow Canadian, Karen Dunbrook. Her use of stencils is second to none and she uses bold and bright colors on most of her cards, which are absolutely stunning. If you haven't been to her blog Snippets, I suggest you check it out - you'll be glad you did! As I mentioned above, I used a piece of drywall tape to stencil the grid background of turquoise (also included a strip on the inside of the card). I cut my own stencil using my Silhouette Cameo ... and I learned something new today. I had cut this before, but when I went to sponge, I'd end up with green ink from the stems in the flower heads or vice versa ... so I cut a new stencil, copying the image so I had two exact matches. Then I ungrouped the images and deleted the stems from one and the flower heads from the other and cut it out. I placed the stems down first, sponged with bright green ink, moved the stencil over so the flower heads lined up with the tops of the stems, and then sponged three shades of orange to give the flowers some depth. Worked great! Hello Loll! Your stenciled background is absolutely gorgeous! The composition and layered images are superb! I am with you about Karen D.! She is absolutely inspiring! So glad that you join the fun with Virginia's View Challenge! (waving hi from Waterloo)! And of course, I am so pleased that you are having fun with the stencil challenge! Hope you continue to play! Am so sorry to read your hubby is so exhausted and that MIL is so ill. I wish him Happy Birthday and am sending good thoughts for all of you. Enjoy that baby! You are rockin' the stencils, Loll! Love the orange/blue combo...so striking! Have yet to try the drywall tape thing...on my list...(it's a long list). HB to hubby and enjoy your time with Cooper! (like I have to tell you that..ha ha). Gorgeous stencil card and cool tip to avoid the muddling of the links. TFS and so pleased you and Gord had such a nice day together. TFS mf. Beautifully done, Loll. Love the combination of colours. How stunningly beautiful this is Loll. Love it. Just love your design, Loll! The pretty flowers against the turquoise grid are really pretty! What beautiful poppies especially against that subtle turquoise background! Bright and uplifting! When I did stenciling years ago (not on cards) I had some stencils that had more than one step like you did. I'd forgotten about that. The stencils are mostly gone now, but I think I may have one or two left. I need to find them and see what I can do. What a stunning creation Loll! This is stunning! I love the softly stencilled background and the gorgeous poppies. Thanks so much for playing along with ASM this week! What a super card! Love the contrasting colors and beautiful flowers! Wow! Hugz! Simply fab, Loll. Thx for the stencil tip. (gotta learn about ungrouping & grouping too). Love the way you've done this one, and that mesh background against the bright pop of orange is a surprise color combo, which works terrific. Happy birthday to Hubby, I'm sure you'll make it a special day for him. TFS & Hugs. So so stunning! It takes my breathe away! Just beautiful! 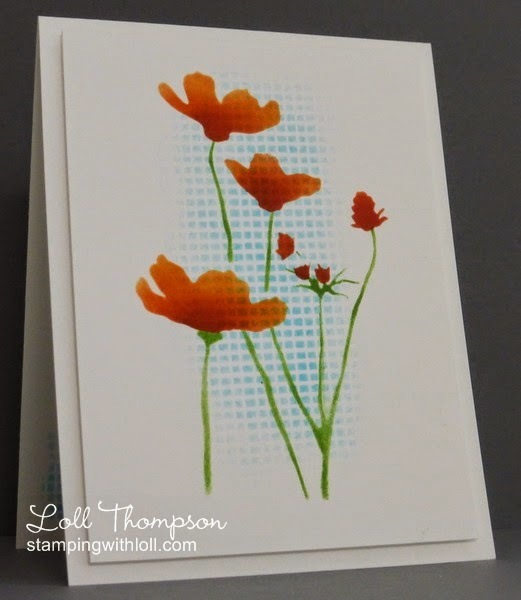 Love that stenciled background behind the beautiful poppies Loll! I love everything you do but I think I have told you that before. Beautiful card! If I were in a card shop and saw this card, I'd buy all of them. Your card is gorgeous! Saw it in Virginia's View Challenge #2 Gallery and just had to comment. The colors of your flowers just pop right off the page! Thanks for explaining in detail how you did it, because I was sure wondering how you got such beautiful flowers from a stencil! GREAT job!